- Get your central heating system cleaned, inspected and serviced by a certified HVAC (heating, venting and air conditioning) contractor every year before using it. - If you have a gas heater, make sure that you have a sufficient quantity of fully functioning carbon monoxide detectors installed in your home. - Make sure that any space heaters are surrounded by at least three feet of empty space. - Never place clothing or any other objects on a space heater to dry. - Do not place space heaters near furniture or drapery. 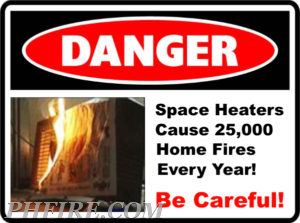 - Turn space heaters off when you leave the house or go to bed. - Avoid storing any combustible items near heaters. - Get your chimney inspected each year to make sure that it is safe. - Hire a chimney sweep to clean out your chimney every fall. - Repair any cracks in fireplaces. - Use fireplace screens to keep sparks and fire debris inside the fireplace. - Do not every use gasoline to start a fire in the fireplace. - Never leave a fire unattended. - Make sure that combustible materials are not stored within three feet of your fireplace. - For natural gas fireplaces, get all connections and lines inspected before use each season. - Remember that outdoor fireplaces can be just as dangerous as indoor units, and observe all safety precautions when using them. www.FirehouseSolutions.com Prospect Heights Fire Dist.